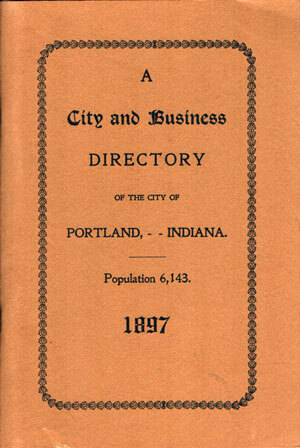 Published by The Sun, Portland, IN, 1897; this is a 1982 reprint by the Jay County Historical Society. Condition is as essentially new. An alphabetical directory of residents of Portland, Indiana in 1897 that includes the name of the resident, their occupation, and first name of their spouse. Also includes a township map of Jay County. Soft cover, 115 pages. Also includes numerous business ads.